Have you thought about making yogurt at home? 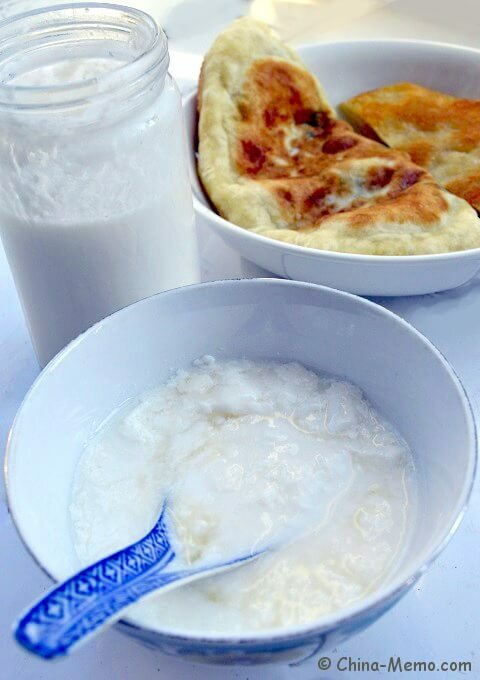 Check my parents' Chinese homemade yogurt, really easy to make! Scroll down for the video. 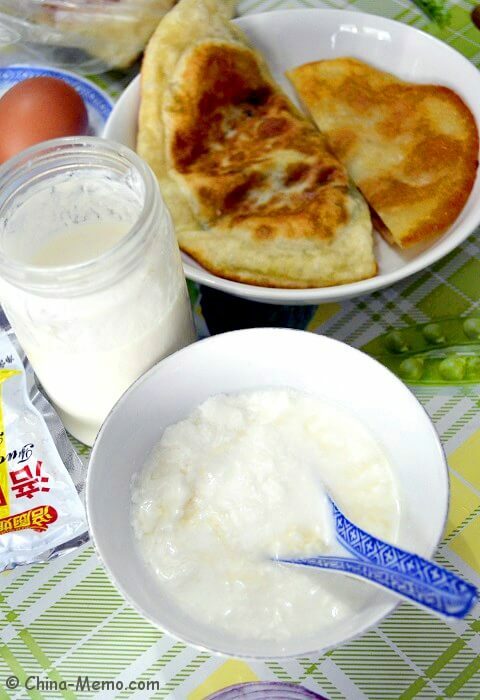 In my childhood memory, our family hardly had yogurt as our daily food because it was rare in the south of China. In fact I never tasted yogurt until I visited Italy for a business trip years ago. I saw my Italian colleagues having yogurt after their meals. Later after I moved to the UK, I started to like yogurt, because it is a good resource for calcium, plus some special yogurt can help our digestive system. My father has the problem of constipation. Later He found out that having natural yogurt can help him. That’s why my parents started to learn to make yogurt at home. They found some tips from the internet and practiced many times. Now they make their yogurt every day. This summer when I visited them, I tried their yogurt, which is as good as those sold from the supermarket. 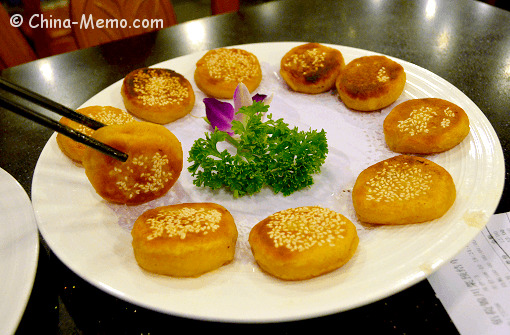 Apart from that, it seems really help the digestive system, at least works well for me and our family. What do you need to make yogurt at home? • a big container such as a thermo flask (vacuum flask). You may use whatever you have as long as you can keep the yogurt warm for 3~4 hours. 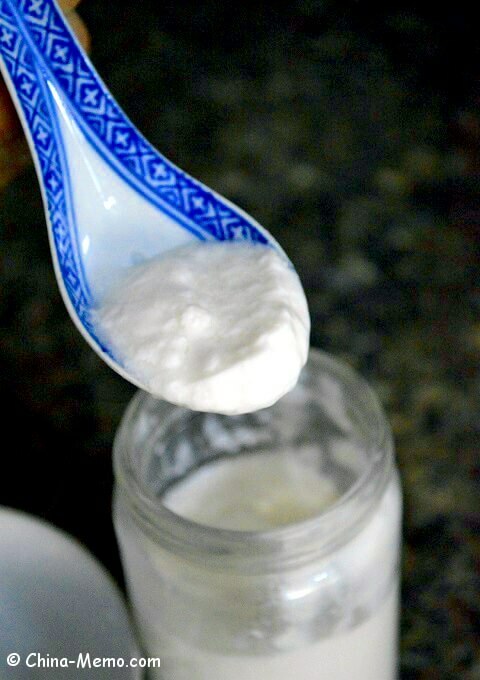 When you make this yogurt for the first time, you may buy some natural yogurt from the supermarket. This natural yogurt will be used as the base. What my parents did is that every time when they made one bottle yogurt, they left 2~4 tbsp yogurt in the container and use them as the base to make the new one. About the big container, my parents use a thermo flask. If you don’t have it, you may use whatever suits you as long as it can keep the yogurt in a warm environment for 3~4 hours. If the place you live is warm or hot enough, you may not need this big container. 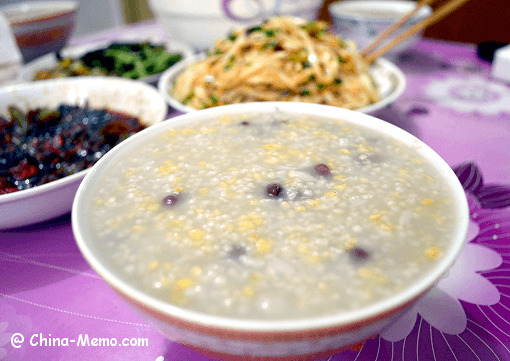 For example, my parents live in China Hunan, where the temperature can reach 37C ~39 C in the summer. Their back balcony near kitchen can reach 30C ~ 35C in the later afternoon. 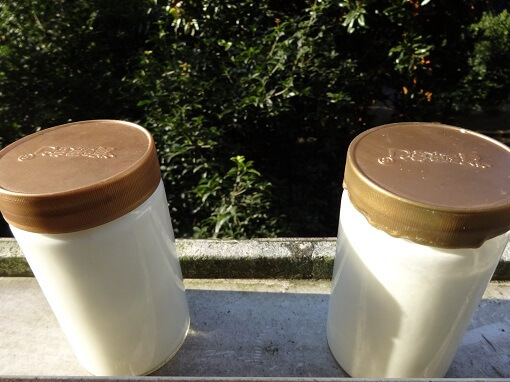 So in the summer they just leave the yogurt container in the back balcony for 3~4 hours, that’s it. • Add 2~4 tbsp natural yogurt into the container as base. 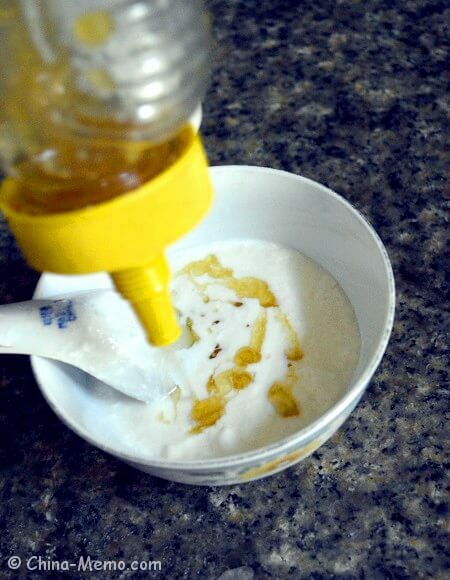 • Add fresh milk and stir to mix with the natural yogurt. 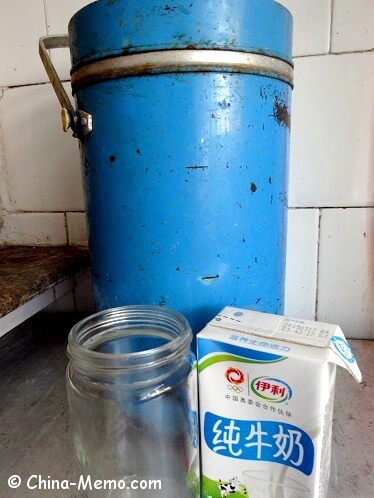 • Put the container in the thermos flask, add warm water (about 35C ~ 40C). • Cover the lid and keep warm for about 4 hours. • Once made, take the yogurt out. If not serve immediately, store it in the fridge for later use. My parents have tried to use the yogurt with fruit flavour as base, but didn’t work well. So this method so far only works for making the natural yogurt. According to my parent’s practice, if it is the first time, the yogurt may not be that dense (or sticky? 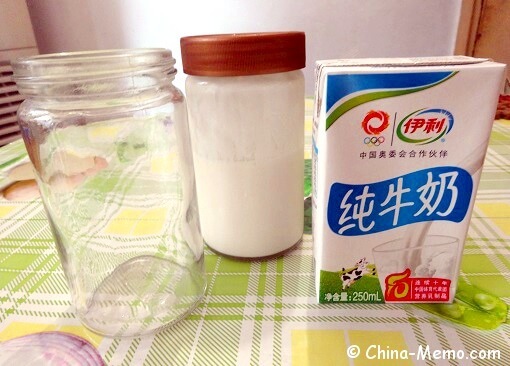 ), but after using the already made yogurt as the base several times, the yogurt would become denser. Because it is natural yogurt, there is no added sugar or flavour. 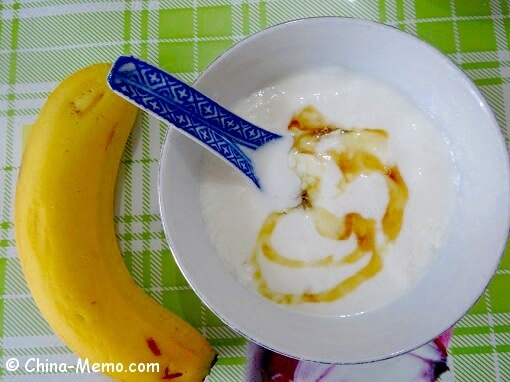 When I have their yogurt, I usually like to add some honey or banana. 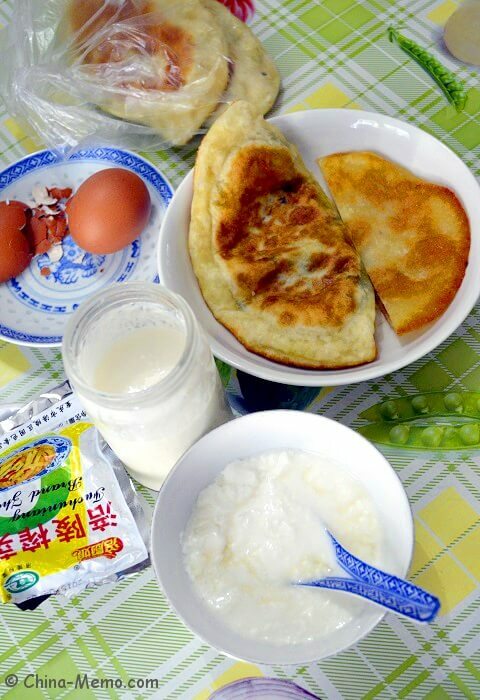 It is good to have it as part of my breakfast, with Chinese breakfast Jian Bing, a pan cake stuffed with chive and eggs.